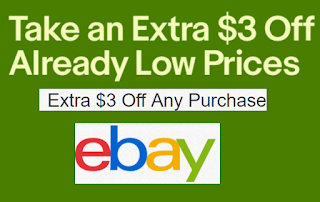 $3 Off Your Ebay Order!!! Get Free or Close to Free Items: PS4 Conrtoller Charging Dock only 2 Cents, 6 Forever Stamps Only $1.60, Free or Cheap Phone Cables and Millions of Other Deals!! Your total must be $3.01 or more for coupon code to work. Codes does not work on shipping charges if there are any, it will only work towards the price of the item.